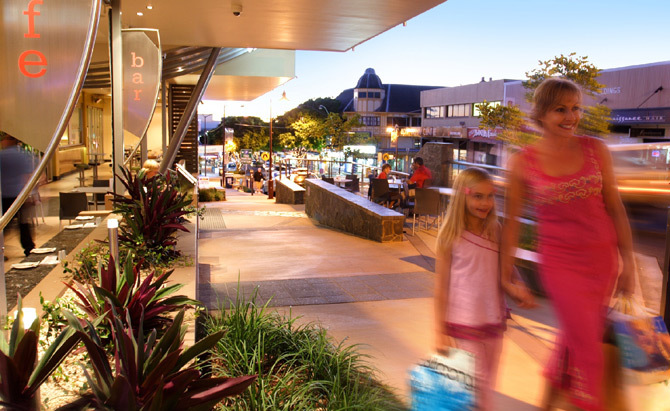 The ever popular and fantastically located Oaks Oasis Caloundra has had an extensive face lift! Unlike poor Aunt Petunia who attempted a face peel and now resembles the tomatoes in her garden, Oaks Oasis has risen like a Phoenix from the flames. The resort boasts a $4 million refurbishment boasting completely renovated studio, one, and two bedroom apartments and the addition of a state of the art water park for the kids. 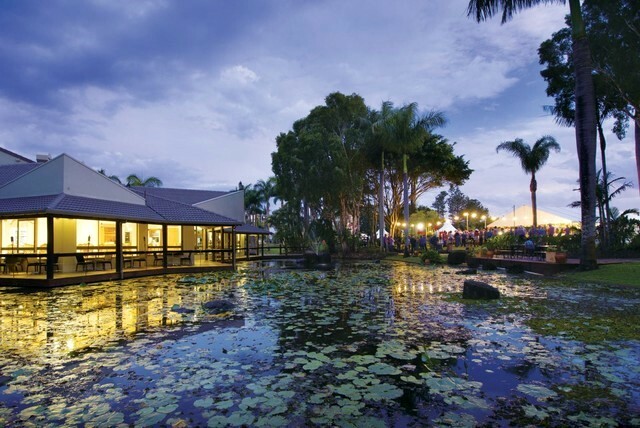 The development has caused quite a fuss on the Sunshine Coast as it has created a unique attraction, a stay and play resort in the heart of one of Australia’s most popular regions – the Sunshine Coast. The exciting new addition to the resort is nestled amongst the green area and the Oaks impressive centre piece, the lily pond. The behemoth fun pit covers a massive 500 square metres which is fringed by splash pools. 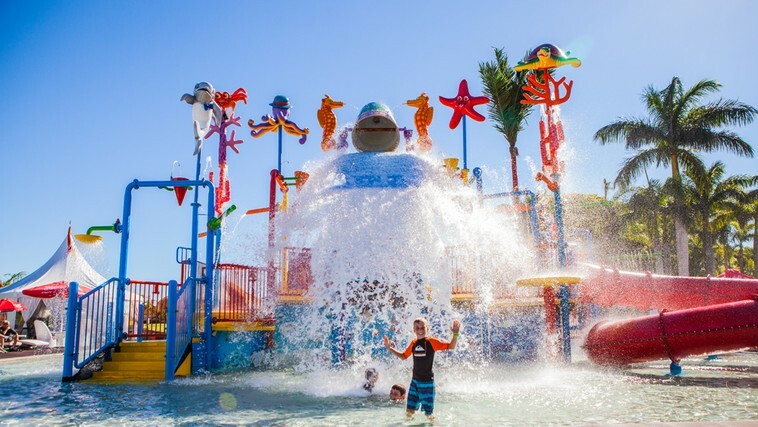 The multilevel structure comes complete with fountains, slides, interactive activities, and a large tipping bucket that surprises the kids every time. And the best part? There's more to come! The "Oaks Oasis Adventure Zone" is one of the final parts of the refurbishment that will include an 18 hole putt putt golf course, giant jumping pillow, sand pit, and climbing frame due to be finalised by early 2016! Parents can retreat to the sun deck surrounding the water park that is laden with sun deck chairs to soak up some warm, enjoy a cocktail, and keep a watchful eye on the little ones. The licensed kiosk not only helps with your dreams of delightful drinks to sip by the pool, but they also offer light snacks. 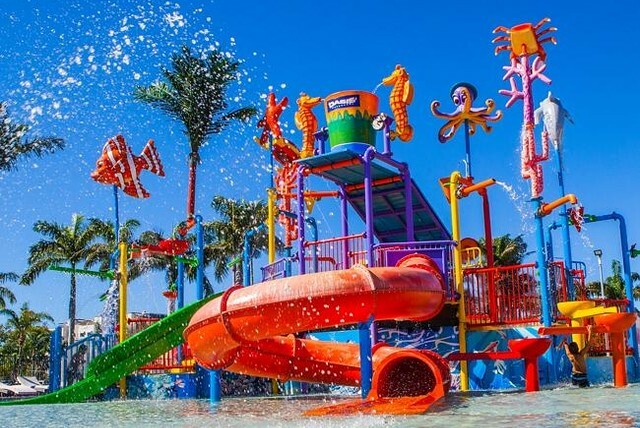 To top the experience off, the waterpark is supervised by an attendant from 9am to 5pm to ensure appropriate behaviour and safety, however, children are not permitted in the waterpark without a guardian aged over 16 and should be watched at all times. Keeping the theme consistent, all suites in the Oaks Oasis have undergone a complete renovation, meaning all guests will share the same awestruck experience of modern styling with contemporary furnishings. Our Hightide staff pick for families, is the Executive Family room, it contains two twin beds, a dining room table, coffee and tea making facilities, and a mini bar fridge. The bathroom is well-lit and spacious, the beds comfortable, and the entire room emanates a fresh and clean atmosphere. Not to mention, having the dining room table is an excellent addition for families as it allows you to make and eat simple meals in a comfortable setting. This is made even easier by the Woolworths grocery store a stone’s throw from Oaks Oasis. Step out of the main entrance and directly across the road lies the supermarket, perfect for stocking up on snacks, fresh fruit, and basic foods. Our Hightide Hot Tip is to take advantage of the proximity of the store as it’s not only great for your budget, but it can be a hassle to prepare the kids (or even just yourselves) to go out for every meal of the day while on holidays. And sometimes an avocado and barbeque chicken filled bread roll is the perfect lunch! The Oaks Oasis is looking pretty darn shmick these days in its post-renovated state, however, it has always been blessed with a beautiful location overlooking Golden Beach and a short 5 to 10 minute walk from Bulcock Beach and its variety of restaurants, cafés, shops, and entertainment. 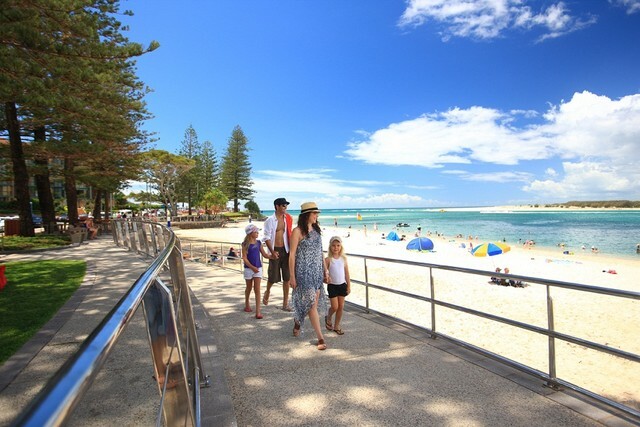 In fact, you are spoilt for choice in terms of sandy stretches fringed by cafés in the city of beaches, you can visit a new beach every day of the week and save Sunday for the Caloundra markets! While Golden Beach is a lovely strip of calm water and often not too busy, Bulcock Beach is popular for being a hive of activity with a greater assortment of eatery options. We even have a Hightide Hot Tip to get you there quicker! 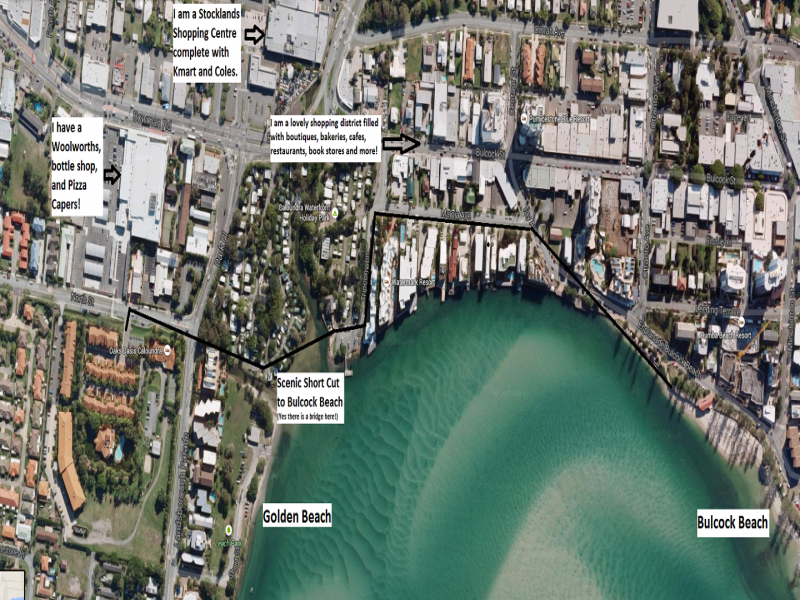 Our super (not really) secret short cut starts as you step out of the resort’s main entrance and turn right, you will see the Caloundra Waterfront Caravan Park which is gated, but open during the day (specific opening times are signed on the gate). This takes you along a much nicer walkway with views over the water to Bulcock Beach. Always an animated area, Bulcock Beach has a lovely strip of alfresco restaurants, fish and chip shops, and cafés to either dine in or grab some take away to enjoy by the waves. One of the most popular pastimes along the beach (besides enjoying the water), is throwing a line in from the boardwalk with the kids. If fishing is not a normal endeavour for you, worry not! There is a handy Stocklands shopping centre with a Kmart located across the road from the Woolworths only another two minutes from Oaks Oasis. Here you will normally find a range of fishing rods and reels for both kids and adults starting from around $9 – which is a pretty cheap evening family activity! The beach also comes equipped a long stretch of flat walkway running along the waterfront perfect for bikes, scooters, and skateboards. The kids will love adventuring along the water finding new beaches, stopping to enjoy an ice cream, and getting a large dose of fun and excitement. The resort also has activities on offer, as well as the hugely popular waterpark there are volleyball courts and tennis courts with gear hire available from reception, a lovely heated pool and as many deck chairs and tables as you could imagine for picnics, board games, and lunch time fun. There are also plenty of grassy areas surrounding the lily filled lagoon, that are perfect for kicking the ball around, enjoying a book next to, or having a picnic. In fact some of the best family time to be had at Oaks Oasis Caloundra is picking up a pizza from Pizza Capers across the road, bringing it back to the resort and enjoying the views as the sunsets over the water. For an upmarket dining experience, Oaks Oasis has you covered. The in-house restaurant, Reflections is open Tuesday through to Saturday for breakfast and dinner. To get out and about, Bulcock Beach offers a myriad of international of flavours as well as good ole Aussie tucker. Our Hightide staff pick is Wung Nam Thai Water Palace who can do amazing things with prawns and serve up a delightful green curry. For a different setting again, Moffat Beach has a lovely nook of boutique cafés on the water. No matter where you turn in Caloundra you will stumble upon an alcove filled with deliciousness. One of the perks of the Sunshine Coast is the family friendly atmosphere with several restaurants offering kids eat free specials on certain nights. Our favourite is Hogs Breath as it’s located within walking distance and kids get a free drink and ice cream included with their complimentary dinner on Monday and Tuesday nights. Dicky Beach Surf Club offer free kids meals with paying adults on Sundays, with the Mooloolaba Bowls Club covering free kids meals on Wednesdays. If you’re craving a casual barbie, duck over to Woolies, pick up some prawns, snags, salad, and bread (a bottle of wine or six pack wouldn’t go astray here), and throw them on the BBQ while the kids play and you the enjoy the laughter, smells, and relaxation. This is the allure of Oaks, you can enjoy 5 star dining, throw a steak on the grill, make a sandwich in your room, or picnic away overlooking the water. The options are endless, and entirely up to you! We all enjoy a smidgen of retail therapy from time to time, and strolling down Bulcock street admiring the boutique shops, bakeries, cafés, restaurants, book stores, homeware nooks, and funky clothing alcoves is technically exercise. Which is good for you. So there you have it, be sure to wander down Bulcock Street and get your shop on for a holiday health kick! Oaks Oasis has become a paradise for families with quality accommodation, a beautiful restaurant, and a lovely, friendly ambience that permeates every corner of the charming resort. 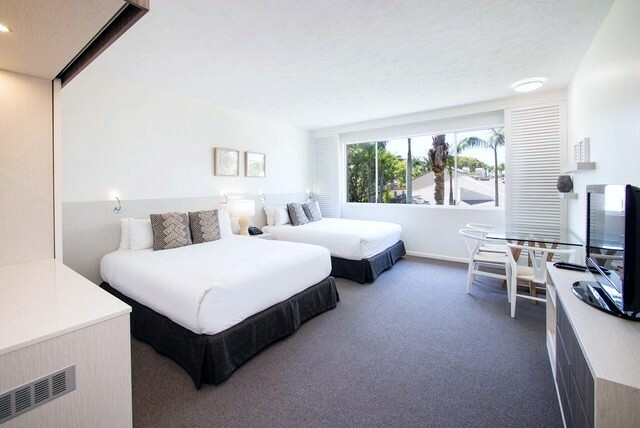 Set amidst the family friendly Caloundra with its myriad of beaches, eateries, and attractions – this resort nails it as a perfect beach escape. 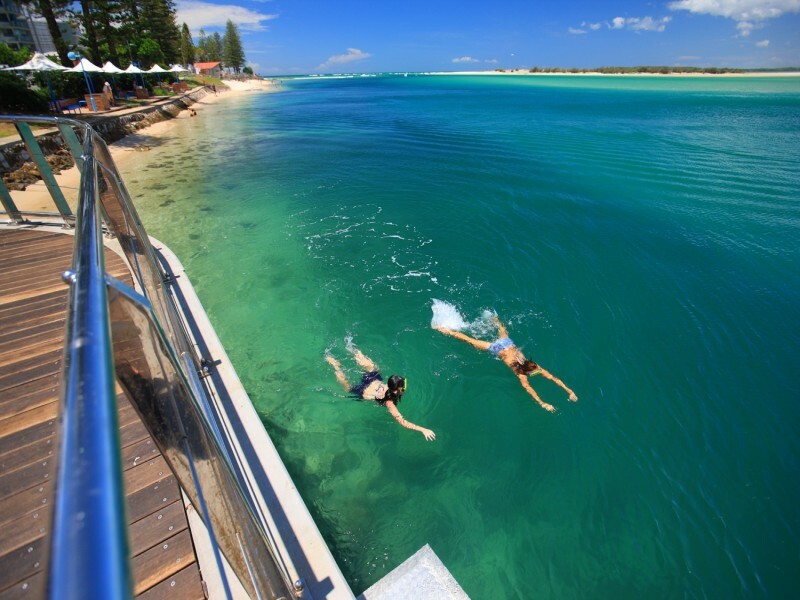 Book your next Sunshine Coast escape with the holiday experts at Hightide today.